This entry was posted in shotgun, weapon and tagged 12ga, 30mm, 37mm, Aimpoint, bullpup, flare, grenade, keltec, KSG, launcher, magpul, pump, Spike's Tactical, Wiley X. Bookmark the permalink. 13 Responses to Say Hello to my Liiitle Friend! Au contraire! If Mr. Goblin attempts to enters my house and finds that pointing at him, one would think he might have second thoughts…. Of course getting 40 MM grenades at my local Wallyworld might be a bit tough but then even a flare would work at that range, hmmm. While it’s true that a flare gun would probably have a pretty good deterrent effect, pointing a shotgun at an attacker is a lot safer- you have a much better chance of doing some damage (without individually registered and taxed AP rounds and a registered and taxed launcher, of course)- and if you live within the civilized world, you haven’t commited a federal felony. Using, and under some interpretations, pointing a flare gun at a technically-human being is likely to get it considered as a destructive device under the law. Possession of an unregistered destructive device is a pretty lame charge to go down on. Фигасе. У вас и подствольники свободно продаются? Actually, after reading that link for the first time in a year, I’ve oversold the situation slightly. You don’t need to individually register rounds unless they’re honest-to-goodness grenades. If you pay the tax on the launcher, you can have a single-shot shotgun with a barrel diameter measured in pounds, not gauge (though many of the commercially available flare guns are not built to the pressure you need for AP rounds). Spikes launcher is built for the pressure, many spikes launchers have been bored out to 40mm and threaded and I don’t know of a single failure with them. How do you operate the action with that launcher attached? 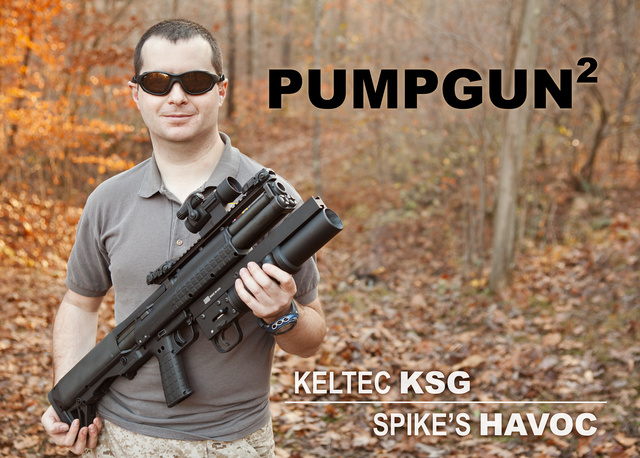 That seems even MORE awkward than the KSG by itself!